The consequences of an accident, a medical mistake or a violent crime often cause serious injuries and great emotional loss. Such physical and emotional losses demand quality legal representation in order to obtain justice and full compensation. 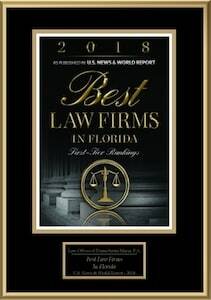 The Fort Lauderdale injury attorneys at the Law Offices of Diana Santa Maria, P.A. will handle your personal injury or medical malpractice claim with compassion, integrity, and skill. Our experienced and professional Fort Lauderdale injury attorneys strive to secure justice and obtain full and fair compensation for clients' injuries. The cases we take are accepted on a contingency fee basis, meaning that clients pay only if we are able to obtain compensation for them. The contingency fee arrangement allows clients from all walks of life and all socio-economic classes to afford the finest legal representation in their time of need without having to incur financial risk. They were committed to seeking justice for me no matter how long it took. La experiencia ha sido lo mejor en el trato y atención. The staff was friendly and the attorneys worked hard on my behalf. I would recommend the firm because of its expertise, knowledge, kindness, and understanding.